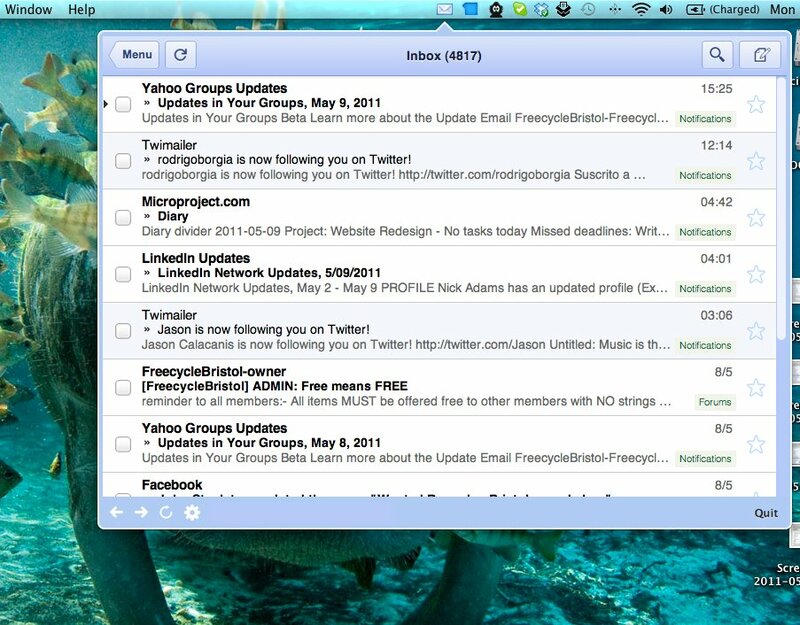 Looking for a way to access your Gmail (s goog) acount from your Mac’s (s aapl) menu bar? Zentertain’s Mailbox is a lightweight app that does just that, adding an envelope icon to your menu bar that, when clicked, pops open a window containing your Gmail inbox. You can read emails, reply to conversations and compose new emails from within that window, all without having to open up your browser. As a very simple, lightweight app that provides speedy desktop access to your Gmail account via your menu bar, it works pretty well. However, if you’re a Google Apps for Domains Gmail user, you’re out of luck: unfortunately, it doesn’t seem to work properly with those accounts. Additionally, there are a couple of extra (albeit probably technically hard to implement) features that would turn it from merely being a convenient way to access the Gmail website into a much more useful application. Robust offline access would be really handy, and make the app more of an equivalent to full-featured desktop email clients like Outlook (s msft) and Apple Mail. Some kind of notifications system for new and unread emails would also be useful — perhaps having a count of unread emails next to the app’s icon in the menu bar, and also having the option of Growl notifications for new emails. I’m with you. I actually started downloading MailTab instead because I was confused.